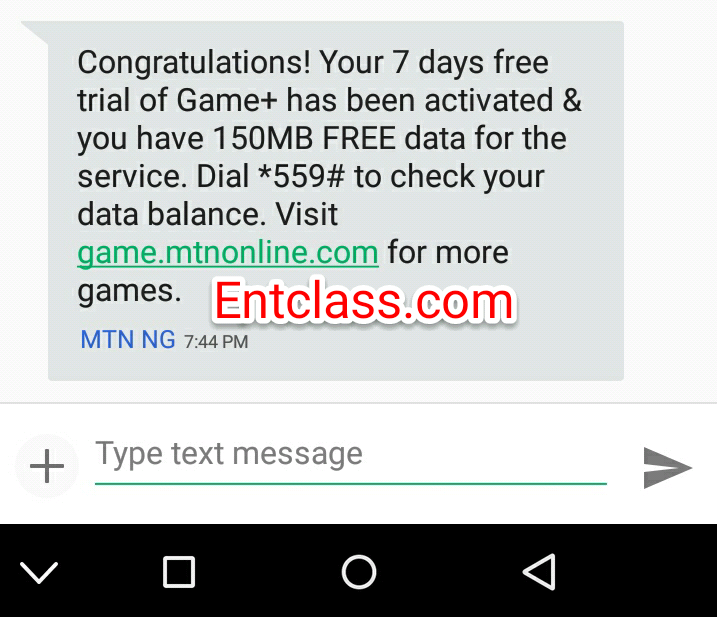 Hello Entclass.com fans, hope you guys are enjoying your free MTN GAME 150MB which I posted hours ago right here on this blog Entclass.com. Anyway, i noticed there was a little problem while trying to renew the 150MB again. 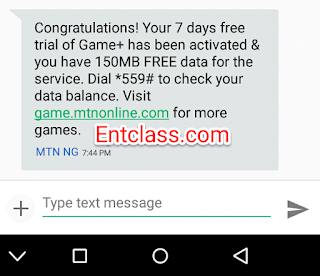 Not to worry, i will give you another code to send so that you will receive another 150mb again but the downside is, it doesn't renew for now. You will receive a congratulations text as seen below. And whaoo, you will get your free 150mb to browse. Dial *559# to check your data balance. Are you just coming? Kindly read the full tweak HERE and how to use it on your Android phone. Are you still confused? Kindly comment below. Don't forget to download our official Android app. Comment if it worked for you cos am enjoying mine now. Always tested and confirmed by me Victor Kachi.